Globally, this has been the hottest winter on record, topping the previous record (2007) by 0.05°F. Globally it’s easily been the hottest start to any year (January-February), beating the previous records (2002, 2007) by 0.07°F. 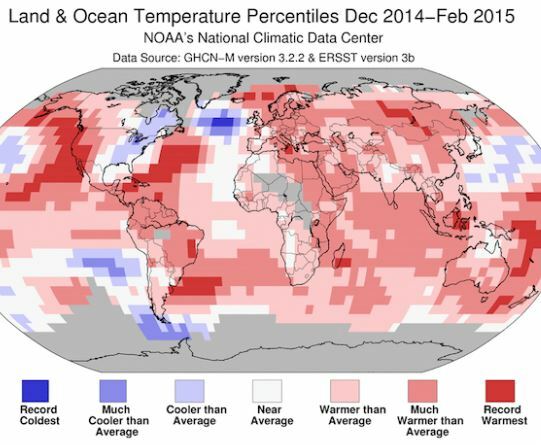 This was the second warmest February globally, and “slightly below” the 20th-century average in the contiguous U.S. Note: For NOAA, winter is the “meteorological winter” (December 2014 to February 2015). As the NOAA map above shows, other than the “cooler than average” northeast, this winter has been “warmer than average” and “much warmer than average” and “record warmest” over every other land area in the world.